Disclaimer: I may be going off half-cocked based on a promotional image on some sort of trade show advertising. In other words- FULL STEAM AHEAD! 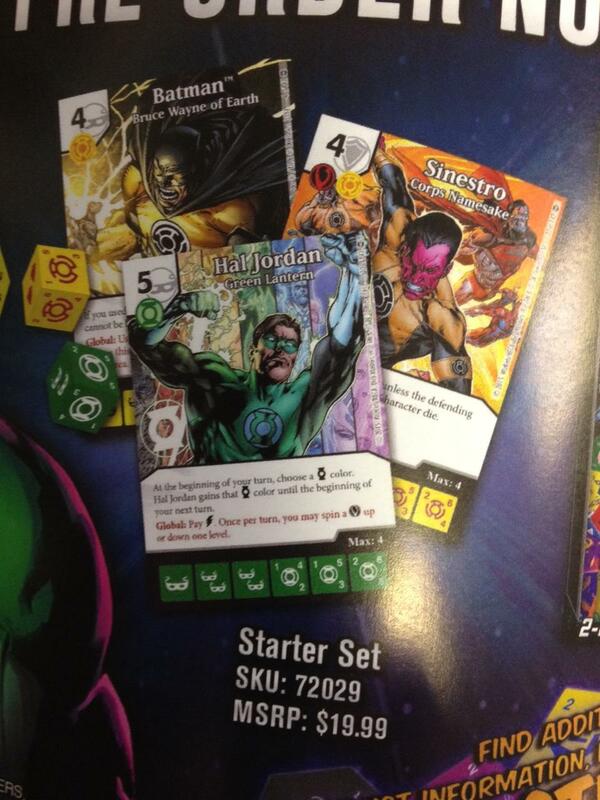 This appears to have exactly the same dice as DC Justice League "Green Lantern - Hal Jordan"
If the WoL Hal Jordan spoiler is accurate, this means WizKids has created a set of cards with (presumably) the same "identity" and same dice, but different titles (Green Lantern vs. Hal Jordan). This would seem to basically screw the usual character identity rule and will require errata to clarify that Hal Jordan == Green Lantern. WoL would seem to have a similar problem with Black Lantern Aquaman - From the Depths. http://www.diceanon.com/wp-content/u...rn-Aquaman.jpg The dice are different (stats, color, energy), but I suspect they don't intend to allow you bring both "Aquaman" and "Black Lantern Aquaman" on the same team. If so, they'll need explicit errata or something like the half-baked "Dragon" rule [a Dragon is any card with "Dragon" (without a preceeding hyphen!) in the title]. Additionally, the game text for this reads (in part) "When fielded, KO all Aquaman Dice...." Is "Black Lantern Aquaman" also "Aquaman"? If so, wouldn't it KO itself? It's a mess. 1. Title is Identity of character. Only one card of a given character per team. 2. Subtitle distinguishes different versions of a character. Subtitle has no game effect. 3. Affiliation, Alignment and other icons clustered around the cost in the upper left-hand corner provide additional properties to the character card. Game effects can reference additional properties. 4. Character card specifies the dice used for the character. 5. A given die type is used on cards of exactly one character (but not necessarily all cards for a given character). I get that WoL is about the Lanterns, and that they want to emphasize that there's more than one Green Lantern, of whom Hal Jordan is one. WoL uses their proper names (Hal Jordan, Guy Gardner, John Stewart, etc.) and I suspect we may see a given character appear as more than one color lantern, subtitled as such ("Guy Gardner - Green Lantern", "Guy Gardner - Red Lantern"). That's cool. But as Dice Masters releases more sets across more IPs, and continues to think of itself as a tournament-worthy MtG style game, I think they need to be increasingly disciplined about following a consistent set of rules (such as outlined above). The Hal Jordan version of Green Lantern is already out there, as "Green Lantern". I would rather they had made an exception to the WoL proper name scheme [i.e. "Green Lantern" instead of "Hal Jordan", and get creative with subtitles] than to have special-cased the global character identity rule [Hal Jordan is the same as Green Lantern]. Ten years from now the first is merely trivia, but the second will live forever in the list of errata. And Black Lantern Aquaman should have been even easier: "Aquaman - From the Depths" with Black Lantern affiliation (which it has). What makes it extra frustrating is that they got this right with the Marvel "Phoenix Force" versions of various characters, Avengers-XMen-Villain team switching versions of characters, and different dice for various existing characters in AoU. In this respect, it looks like WizKids is backsliding in design consistency and coherence with WoL. Enough of my ranting. Maybe the release version of these will be different, and we can all have a laugh about this. Maybe they'll rule that you can't have both Green Lantern and Hal Jordan on the same team. Black Lantern Aquaman in the comics, on the other hand, was a resurrected zombie and not the actual Aquaman. The same for Black Lantern Batman and maybe the other two. I think Wonder Woman was the actual WW and somehow became a Star Sapphire. I believe the Hal Jordan dice in WoL will be translucent, so the die indeed will be different. As for the Black Lanterns, we simply don't have enough information at this point to know. I feel like this is a lot of conjecture, though of course you admit as much in the first line. Black Lantern Aquaman has a different name than Aquaman and thus wouldn't kill itself. However, I'm pretty sure he's also actually Arthur Curry if I recall correctly - he was already dead pre-blackest night since Narwhal killed him and I don't recall anything suggesting that he was a different person. Is War of Light a good choice for the next DC set? Seems mildly confusing to those unfamiliar with the comics.. I dunno. It was a pretty important story that incorporated lots of easily recognized people - though it also has them acting in ways that non-readers might not quite get. It's pretty deep, but also has a lot of pull on the surface. Honestly either Tower of Babel or Night of the Owls might have been a better second set, but I'm fine with War of Light. Flashpoint could be pretty cool too, though it's honestly a headache of a read if you don't know much about The Flash. I would agree that WoL has a lot of familiar characters doing unfamiliar things. I am not a big DC guy, and when I read through the series it had a much darker undead tone then I expected. The familiar faces all getting rings and the variance of who got what and how they used it drew me in. I loved seeing a Batman and Wonder Woman lantern and the dark lanterns. I would love to see a Knightfall, Infinite Crisis or Battle for the Cowl. Night of the Owls was good too. Black Lantern Aquaman has a different name than Aquaman and thus wouldn't kill itself. However, I'm pretty sure he's also actually Arthur Curry if I recall correctly - he was already dead pre-blackest night since Narwhal killed him and I don't recall anything suggesting that he s a different person. I'm not familiar with all the DC multiverse continuity but BL Aquaman was a reanimated Orin, BL Batman a reanimated clone of Batman, and I think BL Superman was the reanimated golden age Superman. Arthur Curry is an Orin - though now that you mention it I don't remember which Orin BL Aquaman is. Gonna have to double check to make sure I'm not being dumb. Unless I'm missing something, it looks like Hal Jordan costs 2 to field on level 3, while Green Lantern costs 1. A somewhat small difference, but a difference nonetheless.